Writing online conversations off (“twittle twattle” – John Prescott) is becoming less of an option. Among the trolls and loons lurk careful pedants. The successful journalist is increasingly defined by their ability to cultivate and harvest the work of such nit-pickers who will find the flaws in your arguments. Such rigorous discussion (notwithstanding the shouty rubbish that often conceals it) is surely in the public interest in the long run. But in the meantime, a useful role for a leader to take can be one of moderation rather than as a participant. Encouraging others to discuss your issues in a civil way and filtering out the ad hominem arguments (dismiss them), the trolls (ban them), the useless comments (delete them) may prove a good way of adjusting to the changing way that public discourse takes place. So how should someone in a position of leadership approach this issue? Firstly, a bit of perspective. 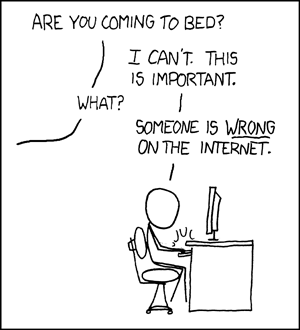 This is, perhaps, the most widely shared posting from the lovely XKCD cartoon website. Dealing with arguments on the Internet can be time consuming – and often frustrating. Unless it’s done in the right way, and in the right place, it may be entirely counterproductive. Some arguments directed at you are good ones. Many more may not be. Either way, getting involved in an argument in a poorly managed discussion thread is a waste of time as you won’t be allowed to ignore the nonsense and just deal with the on-topic evidence-based challenges. Avoid high-volume threads that aren’t managed well. Most newspaper comment threads – and even those attached to the leading political blogs tend not to be too carefully policed and there is little to be gained in challenging your critics here – unless you are genuinely interested in flushing out all of the arguments that are likely to be levelled at you and a particular position you are taking. If a comment thread is poorly policed, then you may think that the moral arguments against becoming an anonymous commenter are fairly weak. Take care here as it can backfire quite badly. Online commenters are quite good at sniffing out sock-puppetry. Option one: This may mean establishing your own blog – my house my rules. If you do this, then you need to come up with the rules in question and apply them fairly. This involves some research, some intellectual manual labour in refining them, and some time spend policing them (with the help of good commenting tools that do some of your moderation for you). Bear in mind that most of the more influential political bloggers (including blogging MPs) have closed their sites down – this should give you an idea about the value of this approach. Option two: This can lead you to Facebook, or maybe to a very rare example of a heavily-policed weblog. Conversations are likely to be more civil there as abusiveness can cause a suspension of an account. In addition, you are – almost by definition – ‘among friends’. When you do comment on something, your respondents have to take responsibility for the tone and fairness of their replies and are much more likely to be civil. Option three: This still involves some amount of monitoring. It may even help to post links to your more potent critics articles without much comment on places like Facebook. It invites your friends to get stuck in on your behalf. Leaving well-argued personal or political challenges unanswered may not be sustainable in the long-run. It may be what real friends are for…. Arguments on the Internet may appear more nasty and low-grade than those conducted elsewhere; but if you get involved, you need to know that you will have to perform to a much higher standard than you would do in a public debate, on TV or in front of a hectoring journalist. Since the early Internet discussion forums such as Usenet, the hive mind of the web has examined and anatomised arguments. If you fib, exaggerate or treat an interlocutor without the respect that is due to them, you will come to regret it – and moreso if you’re a public figure. For every five or ten trolls and flamers, there is going to be a well-mannered pedant who will leave you with no option but to justify your arguments or withdraw them. This could be the stuff of nightmares. Here’s a list of the rules that can be applied to good arguments. Learning to apply them to others’ conversations is a valuable skill, and knowing it can allow you to adopt the most useful approach to online discussion – the moderator and the listener. Increasingly, leadership may be less about participating in arguments as it is about learning from them.